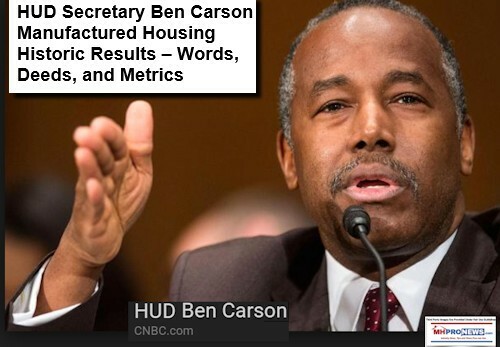 Manufactured Housing is every bit as “amazing” as HUD Secretary Carson said in a video found on MHLivingNews.com. Secretary Carson had even more to say, his full prepared statements are exclusively found at this link here. Manufactured homes are indeed a “phenomenon,” as award-winning industry veteran Ron Thomas, Sr. told MHProNews. The industry needs good data for investors and lenders, and accurate reporting for the public, as MHI/NCC member and RV Horizon’s Frank Rolfe has said. It is more important “to pay attention to what people do, than what they say,” and to “follow the money,” as award winning industry success story, Marty Lavin, J.D., told the Daily Business News. If the Duty to Serve (DTS) Manufactured Housing had been optional, Congress would not have called it a “Duty,” which means mandatory, as Mark Weiss, J.D. has said. The industry is indeed recovering from its 2009 “nadir,” as George Allen likes to phrase it. In 2002, Eric Belsky with Harvard University was cited as predicting that manufactured housing would overtake conventional housing by the end of the decade. That citation was in a report by the Manufactured Housing Institute (MHI) over a decade ago, but not much since. When Up for Growth recently said similarly – that there’s been over 7 million units needed that weren’t built in recent years – why didn’t Belsky’s prediction come true? In 2003, Warren Buffett’s Berkshire Hathaway bought Clayton Homes, and then Oakwood Homes, which combined became the biggest producer of manufactured housing by that year’s end. In 2009, Tim Williams President and CEO of 21st Mortgage Corp, issued a letter that explained that they would cut-off specified financing to manufactured home industry retailers who weren’t selling specific Clayton brands. Williams said Berkshire couldn’t afford to continue to make those loans, which they previously made on other producers’ products. By 2011, Berkshire Hathaway’s Clayton Homes CEO, Kevin Clayton said that his company was 25 percent of the manufactured housing industry’s production. In an video interview with exclusive details added to his unedited words, Clayton explained in various ways Warren Buffett’s principle of “the Moat,” and how it was used to best competitors in a manner some have described as monopolistic. Clayton also said in that same video that “Warren” assured him they had “plenty of money,” and that they had invested billions of dollars in acquisitions and loans every year since they were purchased. In fact, Kevin names some of their acquisitions and billions in investments in that video. Doesn’t Kevin Clayton’s freely made comment about having “plenty of money” contradict what Tim Williams said less than two years before as his reason to cut off lending to industry independents? Doesn’t Berkshire Hathaway’s billions of cash on hand in 2009, 2010, etc., also contradict Williams’ letter, which cut off/limited funding to independent retailers? Didn’t several independent producers fail or sell out – often to Clayton – in the wake of Tim Williams’ letter? Since the above, Buffett’s Berkshire brands have now become about 50 percent of the manufactured housing industry’s production. Buffett has said, he likes a bargain. By cutting off lending and capital, several firms sold out for less or failed that would have been the case had more capital been made available. For years, the four person Executive Committee of the Manufactured Housing Institute (MHI) has been comprised of 2 employees of Berkshire Hathaway companies. One or two of the other companies represented on the MHI Executive Committee also did business with Berkshire Hathaway owned companies. The fingerprints of Berkshire’s influence over MHI are unmistakable. In 2008, the SAFE Act was passed, with aspects problematic for the manufactured housing industry, which played no role in the 2008 Housing/Mortgage meltdown. MHI failed to head the SAFE Act off, why? Why did Buffett back Secretary Hillary Clinton – who vowed to keep Dodd-Frank unchanged – instead of Donald J. Trump? In 2008, the Housing and Economic Recovery Act (HERA) was passed, which included the SAFE Act, but also included the Duty to Serve (DTS) Manufactured housing imposed by federal law on the Government Sponsored Enterprises (GSEs). A decade after DTS was passed, both of the GSEs have finally announced limited pilot programs. They stated their pilots were limited in part due to a lack of recent data. Yet Triad and Credit Human provided data. CFED rebranded as Prosperity Now pointed the GSEs to data on an over $1 billion dollar loan portfolio that performed well. Tim Williams admitted in a group of a few dozen MHI member that 21st Mortgage and Vanderbilt Mortgage (VMF) did not provide data to the GSEs. That was confirmed by Paul Barretto of Fannie Mae, to MHProNews in front of dozens of attendees in Tunica in March of 2018. Yet, Lesli Gooch, Ph.D. and EVP for MHI has said that MHI is doing all that they can to move chattel lending ahead for manufactured home companies. Really? How can that be said with a straight face, when their largest lenders have not done all – or any – data sharing that they can do? Mark Weiss, JD, President and CEO of MHARR (Manufactured Housing Association for Regulatory Reform) has said that every day that the GSEs don’t robustly implement chattel lending for manufactured homes is a gift to Berkshire Hathaway. Not last for this hot topic, and not the least is the issue of image and education. 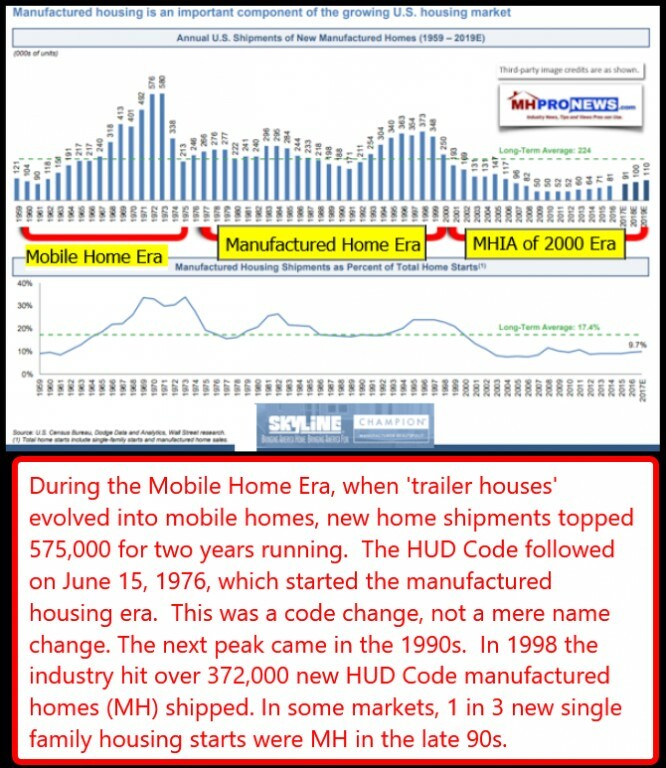 MHI has arguably failed for years to do anything meaningful about responding routinely to false or misleading reports in mainstream media or academia about “mobile homes,” ”trailer houses,” or “trailer parks” when those issue arise weekly in the news. Tim Williams/21st and then MHI Chairman admitted there’s “a good argument” for doing precisely that, then why hasn’t it been done? 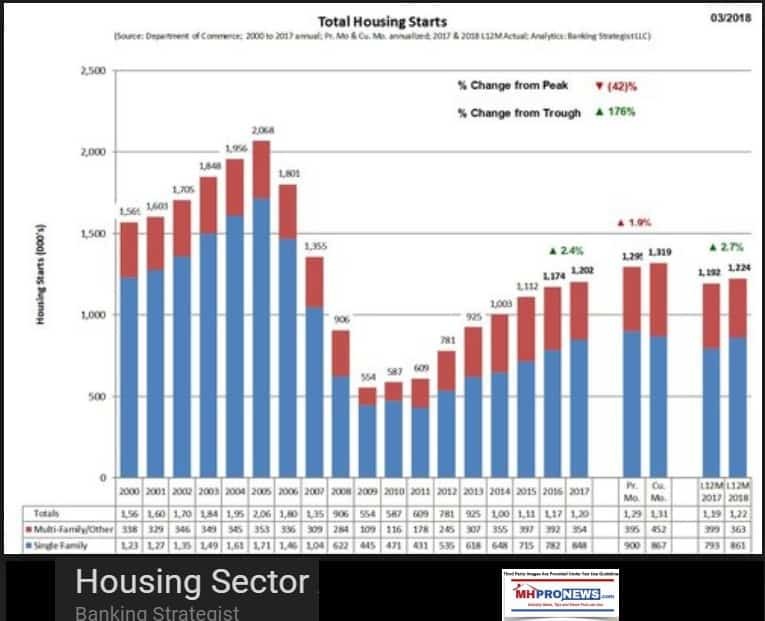 Advertorials and their MHI social media pages clearly have not moved the needle from the still historically low levels the industry sunk to in 2009, as our recovery is still just a fraction of what RVs, single family housing, or multifamily housing starts are. That’s opportunity in disguise for the forward thinkers and doers. But it isn’t it also a sign of failed leadership? It is time for Manufactured Home Owners, investors, and professionals to realize what has actually happened in our industry. Pretty sound words and years of failed promises by MHI and the powers behind them ought to result in accountability. Instead, paid staff have had raises and bonuses. Rewarding words alone, no matter how pretty those words are, clearly isn’t enough. Deeds and performance must follow those words. Thousands of emails is interesting, or lots of likes on social media looks cool. But absent passing legislation, achieving reforms, or seeing a robust increase in sales — those are true measures of success. MHI has failed to perform for the majority of the industry’s independent companies. A few voices have had the courage to point out aspects of these issues, but not enough. Reality Check. What this data shows is that manufactured housing is about 7.5 percent of all single and multi family U.S. housing starts. Given how cost effective manufactured homes are, isn’t this an indictment of the industry’s major association and business leadership?? RVs, a luxury item, outsell manufactured homes by some 5 to 1. That said, there is tremendous possible upside for the industry, given the right mix of regulatory, investor and industry efforts. The Trump Administration is doing it’s part, as Secretary Carson recently said – once more – linked here. Editorially, we hope and pray that HUD will ask the Federal Trade Commission (FTC) and the Department of Justice (DOJ) to start or step up their investigations and actions to break up the allegedly monopolistic practices of Berkshire Hathaway and their surrogates, MHI. Manufactured Housing is the solution to the affordable housing crisis that is hiding in plain sight. While production, retail and lending – among other niches – are widely seen as dominated by Berkshire Hathaway brands, there are still more independents – for example – in manufactured home communities. But for how long? – L. A. “Tony” Kovach.